by Andy Higgs in Europe, Features, Home, Places, Portugal. 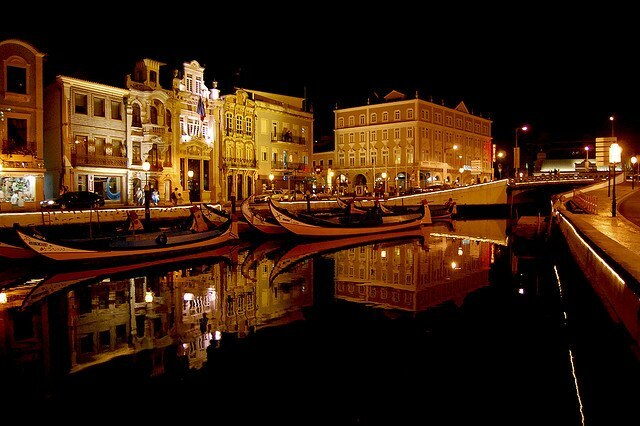 Aveiro is often referred to as the Venice of Portugal. Yes, I can see your eyes glazing over at that tired cliche but there is better justification here than most places given that accolade. Aveiro is certainly a place where water plays a major part; the main canal dominates the entrance to the city and is lined with some wonderful examples of Portuguese architecture – especially the Art Nouveau buildings. The colourful boats known as ‘moliceiros’ drift slowly by – originally used for collecting seaweed for use as fertiliser but now offering canal trips around the town or out on the lagoon. If you prefer to stay on dry land, rent a ‘buga’, one of the free bicycles provided by the city council and visit Aveiro’s famous sights including its museum, cathedral and bustling fish market. If you fancy going further afield try the town of Barra which is home to the tallest lighthouse on the Iberian Peninsula. Braga is not only the oldest city in the country but is also considered to be Portugal’s most religiously conservative, having maintained its strong ties with Christianity. It’s a great place to just wander at will and soak up the atmosphere. The Praça da República Square is a good place to aim for – have a break at one of the cafes with their outdoor tables. D. Diogo de Sousa Street has a wide variety of shops including many that sell religious artefacts – so pop in if you fancy a painting of the Pope or a graphic depiction of the crucifixtion. The Bom Jesus Natural Park and Bom Jesus do Monte Sanctuary are located on a pretty hilltop reached by funicular railway from Braga’s historical centre. The views from here are spectacular and the Sanctuary is a grand 19th century building that is a popular destination for pilgrims. If you stay for dinner don’t miss the excellent BRAC Restaurant which boasts its own Roman ruins on the premises(!) – ask the waiter for a tour. 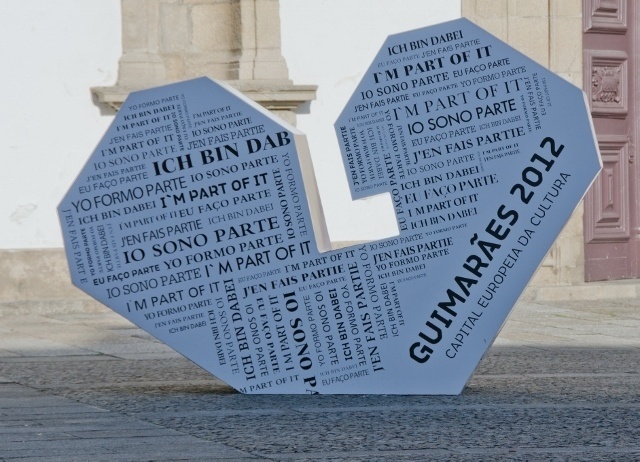 Guimarães is the European Capital of Culture for 2012 and you’ll see different types of hearts all over town – the heart being the symbol adopted by Guimarães to promote this fact. It is also a UNESCO World Heritage Site and is said to be the birthplace of Portugal as a country. The highlight for visitors is the magnificent castle, which was nominated as one of the New Portuguese Seven Wonders. Again the town is best seen by wandering on foot; there are beautifully preserved buildings and narrow streets lined with cafes, restaurants and interesting shops and the town squares are lively and filled with tourists and locals alike. For lunch or dinner we highly recommend the traditional Portuguese fare on offer at Restaurante Florêncio, an informal, friendly and spacious eatery where you can enjoy homely food and delicious Vinho Verde wine which comes from this area. The Peneda-Gerês National Park is located in the far north of Portugal between the Atlantic Coast and the Spanish border. Here you can recharge your batteries and get back to nature for a while. Explore the park by walking along narrow trails or on the remains of Roman roads and look out for wildlife that once roamed free throughout Europe but has now vanished from most other countries; the park the refuge of some of Europe’s last surviving great predators. It is home to wild boar, foxes, deer, otters, badgers, eagles and the last surviving wolves on the continent. 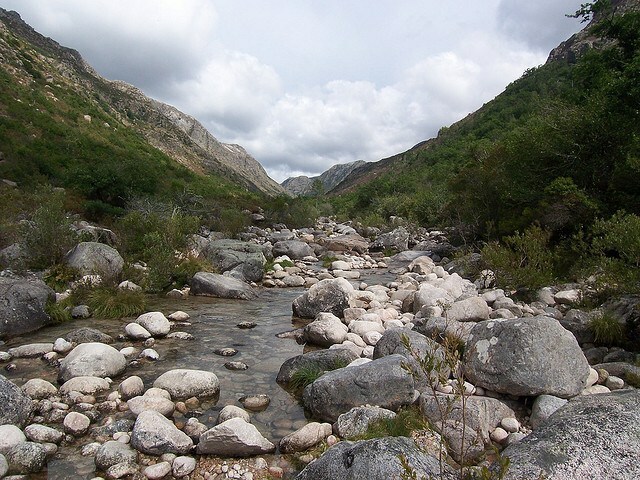 The landscape of the Peneda-Gerês National Park ranges from green river valleys to bare rocky mountains and is also dotted with the remnants of great civilizations – rock carvings, graves and ancient megaliths have been discovered here along with the Celtic ruins medieval castles looming above tiny hill towns where modern life has yet to intrude and oxen are still used to plough the fields. This 170 acre adventure park is the perfect place for burning a few calories and raising your adrenaline level after all that Port wine and good food. Here you can try your hand at activities ranging such as hiking, mountain biking or bungee jumping. With highly qualified staff to oversee the action, DiverLanhoso lets you feel like you’re risking your life while providing the necessary security to make sure that you’re taken care of. The park has 38 suspension bridges made of rope and wood to wobble your way over, and in the water you can go rafting, kayaking and canoeing. 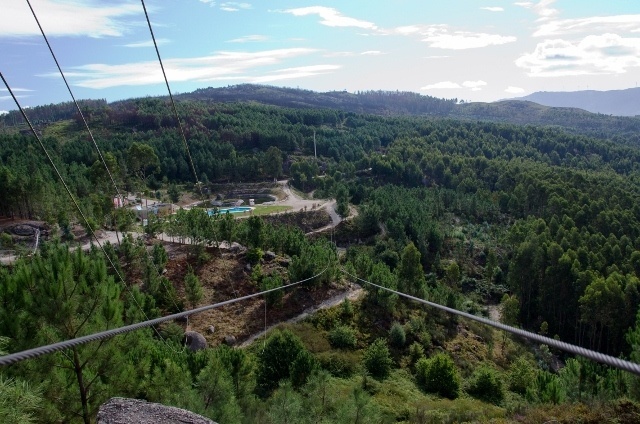 Make sure you try the 350 metre zipline and pendulum jump if you’re up to it. DiverLanhoso also has a panoramic restaurant which is a good place to relax and bring your blood pressure back to a more normal level, There is also a swimming pool if all that action seems like hard work. 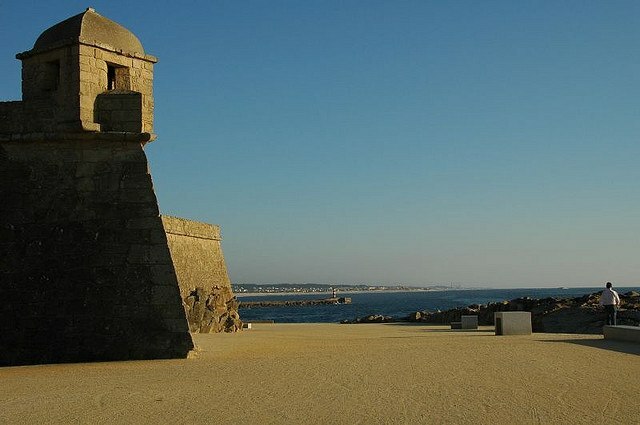 The beaches in Porto are a little rocky and thus not good for swimming, but travel some 27 km north to Vila do Conde and you’ll find a delightful seaside town dominated by the enormous Convent of Santa Clara. Previously the town was an important ship-building centre providing transport for Portugal’s Age of Discovery in the 15th and 16th centuries. These days the old town is still an active fishing port and is host to a lively market on Fridays. The medieval quarter is great for a stroll but the excellent beaches of Guia and Forno are the main reason to visit in the summer. Vila do Conde is also famous for lace-making and keeps this tradition going at the Escola de Rendas (lace-making school) in the Lace Museum on Rua de São Bento. For a little more action, travel another 3 km north to Póvoa de Varzim for its pulsating night-life. Hi Paddy, that sounds great. It’s always good when you can catch a special event in a special place. Yeah, how weird is that Heather? Glad you liked them and happy trails to you…! After TBU, I’m itching to go back and explore – missed the day trips for my day job, unfortunately! Can you get to Lanhoso by train or another public transport from Porto? Unfortunately the best way to get to Lanhoso is with your own car – it’s a bit remote. But I would recommend emailing the guys who run it to ask for advice; they may know of local transport. It’s worth the effort and is actually only about an hour’s drive from Porto. You can also take a cable car up to Penha park, which is perched on a hill that looks out over the town. 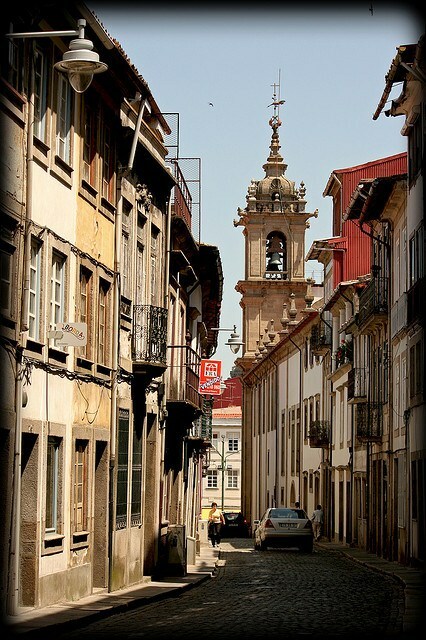 Guimaraes is about an hour from Porto, with frequent trains departing from Sao Bento central station.